Reacting to Earnings Reports: Let's get real! In my last two posts, I considered how earnings reports can generate narrative shifts or changes, thus affecting value, and pricing effects, when companies trail or beat investors’ estimates on metrics (earnings per share, revenues, user numbers etc.). In this one, I intend to apply the lessons in those posts to three companies that I have been working with over the last couple of years: Apple, Facebook and Twitter. In particular, I would like to look at the most recent earnings report for each company, the news each report contained, the distractions in each one and the effect on stock prices. I would also like to look at the information in past earnings reports for each company, over the entire (limited) histories for Facebook and Twitter’s, and the last two years of reports for Apple, with the intent of incorporating what I have learned into updating my narrative for each company. Note that while stock prices have ranged from $45 to close to $100 over this period, my value estimates have had a much tighter range, reflecting my largely unchanged story line for the company, over the period. Starting in 2011, my narrative for Apple has been that it is a mature company, with limited growth potential (revenue growth rates< 5%) and sustained profitability, albeit with downward pressure on margins, as its core businesses becomes more competitive. I allowed for only a small probability that the company would introduce another disruptive product to follow up its trifecta from the prior decade (the iPod, the iPhone and the iPad), partly because of its large market cap and partly because I thought it had used up its disruption karma over recent years. Looking at the earnings reports from the company over the last nine quarters, it is remarkable how little that narrative has changed. In the first two sets of columns, I report on Apple’s revenues and earnings per share and contrast the actual numbers with the consensus estimate for these numbers in each quarter. For much of the time period, Apple has matched or beaten revenue and earnings estimates, albeit by small amounts, but the market has been unimpressed, with stock prices down on six of the nine post-report days and seven of the nine post-report weeks. Note that after controlling for the quarterly variations, revenues have been flat or have had only mild growth and operating margins have been on a mild downward trend. With Apple, the other focus in the earnings reports has been on how iPhone and iPad sales are doing and the table below reports on the unit sales that Apple reported each quarter, with the growth rates over the same quarter’s sales in the prior year. In the last two columns, I report Apple’s global market share in the smartphone and tablet markets, by quarter. While the market fixation with Apple’s iPhone and iPad sales may be disconcerting to some, it makes sense for two reasons. First, it reflects the fact that Apple derives most of its revenues from smartphones/tablets and that the growth in unit sales and change in market share therefore becomes a proxy for future revenue growth. Second, Apple’s earnings are being sustained by its impressive profit margins in the smartphone and table businesses and looking at how well it is doing in these markets becomes a stand-in for how sustainable the company’s margins (and earnings) will be in the future. Each quarter, there are rumors of another Apple disruption in the works, but each time the promises of an iWatch or an iTV don’t pan out, investor expectations that Apple will pull another rabbit out of its hat have eased. The most recent earnings report seems to reflect this period of stability, temporary though it may be, for Apple, where investor expectations have moderated and the company is being measured for what it really is: an extraordinarily profitable company, with the most valuable franchise in the world. It seems to have stabilized its position in the smart phone world, is seeing its tablet market shrink and its personal computer business is being treated as a rump business. In effect, analysts are treating it as a mature company that is being powered by the iPhone money machine, where margins are declining only gradually. Since that is the narrative that I have using all along in my valuations, I see little change in my assessment of intrinsic value for Apple. Allowing for the stock split, the value per share that I assess for the company, with the information in the new earnings report incorporated into my estimates, is $96.55, almost unchanged from my estimate of $96.43 in April 2014. With the new iPhone 6 launch just a few months away, I am sure that the distractions will start anew, and I think it is prudent for me as an investor to map out an exit plan, if the stock price rises to $100 or higher. If it does not, I will happily continue to hold Apple, collect my dividends, and hope for a disruption down the road. I valued Facebook just before its IPO in this post, and argued that the stock was being over priced at $38 for the offering. The tepid response to the offering price made me look right, but for all the wrong reasons. The botched IPO was not because the stock was over priced or because the market attached a lower value to the stock but largely due to the hubris of Facebook’s investment bankers who seemed to not only think that the stock would sell itself but actively worked against setting a narrative for the company. My initial valuation, though it will look conservative in hindsight, was based upon the belief that Facebook would be as successful as Google in its growth in the online advertising business, while maintaining its sky-high profit margins. Looking at Facebook’s earnings reports since its IPO, there have been nine reports and the market reaction has shifted significantly over the period. I think that the botched public offering colored the market response to the very first earnings report, with the stock down almost 25%. In fact, I revalued Facebook after this report, when the stock price plunged below $20, and wrote this post, arguing that there was nothing in the report that changed the narrative and that the company looked under valued to me. I was lucky enough to catch it at its low point, since the company turned the corner with the market by the next quarter and the stock price more than doubled over the following year. I revisited the valuation after the August 2013 earnings report, and chose not to change my narrative, leaving me with the conclusion that the stock was fully priced at $45 and that it was prudent to sell. Looking at the earnings numbers over the nine quarters, it is clear that has Facebook has mastered the analyst expectations game, delivering better-than-expected numbers for both revenues and earnings per share for each of the last seven quarters. While my initial reaction to Facebook’s success on the mobile front was that it was what it needed to do to sustain its narrative as a successful online advertising company, the rate at which it has grown in the mobile market has been staggering. In fact, I think that there is now a very real possibility that Facebook will supplant Google as the online advertising king and continue to maintain its profitability. That is a narrative shift, which will translate into a larger market share of the online advertising market, higher revenue growth and perhaps more sustainable operating margins (than I had forecast). The inexorable growth in the user base, astonishing given how large the base already is, has also been surprising. That remains Facebook’s biggest asset and a platform that they can try to use to enter new markets and sell new products/services. Facebook has also shown a willingness to spend large amounts of money on acquiring the pieces that it needs to keep increasing its user base and build on it. The downside of this strategy is that growth has been costly (though the costs are hidden for the moment in the financials), but the upside is that is putting in place the pieces it needs to monetize its user base. While the revenue breakdown does not reflect this business expansion yet, I think that Facebook is better positioned for a narrative change now than it was a year or two ago. My updated valuation for Facebook reflects these adjustments. Incorporating a higher revenue target ($90 billion, rather than $60 billion) and more sustained margins (40% instead of 35%) , I estimate a value per share of $63 today. For those of you who have been taking me to task for selling at $45 in September 2013, I commend you for your foresight in holding on to the stock, but I am at peace with decision for two reasons. First, given what I knew in September 2013, I did what I had to do, given my investment philosophy, and second guessing it now is an exercise in futility. Second, if the biggest regret I have in my investing life is that I sold a stock to make a 150% return rather than holding on to it to make a 300% return, I would consider myself to be truly blessed. I may be compounding my mistake here, but at $72, I don't see it as a bargain, and I am in no hurry to buy the stock now. For those of you who are Facebook stockholders, though, this may be one of those companies where the value could chase the price for years, as the company finds way to turn the possible into the plausible and the plausible into the possible, and I wish you only positive returns. In the weeks leading up to the Twitter IPO, I wrestled with valuing the company. In the valuation that I did in the week before the IPO, the narrative I offered was of a company that would become a significant but not a dominant player in the online advertising business. I argued Twitter’s strength (the 140 character limit on messages) would also be its weakness, and that businesses would be loath to make Twitter their primary advertising platform. My targeted revenues in ten years were still substantial, and in conjunction with a healthy profit margin of 25%, yielded a value per share of $18, well below the offering price of $26 and even further below the opening day price of $46. In the months since, Twitter has had three earnings reports, and the accounting results are summarized below, with analyst expectations and the stock price reaction to each report. The negative reaction to the second earnings report was partly due to the low growth (relative to expectations) that Twitter reported in the number of users and the positive reaction to the last report seems to be traceable to Twitter beating analyst expectations for user growth in the most recent quarter. Looking at both the accounting and user numbers, what is striking about Twitter is how little the company has changed over the period that it has been in the market. The proportion of revenues it receives from advertising has remained around 90%, its revenues from international sales have increased only marginally and its mobile advertising has stayed at a high percentage of revenues (which is not surprising given that its compact format travels well to mobile devices). Its use of invested capital has not become more efficient and while you may argue that this is early in the game, contrast Twitter's evolution with Facebook's over the first few quarters. There is nothing that I see (and I may be missing some key component) in these reports that would lead me to reassess my initial narrative, i.e., that Twitter will be a successful, but not dominant online advertising company, and the last earnings report only reinforced that view. There was some good news in the report, especially on the revenue front, but there was some game playing that was needless, in my view. First, as this article points out, the user numbers includes those who are not Twitter users in the conventional sense but are exposed to tweets in the context of news stories. Since these indirect users will not get to see (and therefor click on) the sponsored tweets that are the company’s advertising mainstay, I think that including them with total users is a little misleading, though the company may not have intended to be deceptive. Second, and this is not a problem specific to only Twitter, is the claim that the company actually made money, if you do not count stock-based compensation as an expense. As I argued in this post, this is nonsense, but I blame the analysts and investors who buy into this fiction just as much as I do the companies that feed them the fiction. In fact, as I listened in on the Twitter earnings call, I was left with the uneasy feeling that this was an earnings report produced for equity research analysts, by an equity research analyst, in terms of the numbers it emphasized. It may be pure coincidence that Twitter acquired a new CFO between its last report and this one, and that in addition to being a banker who led their public offering, he was an equity research analyst in a prior incarnation, but I don't think so. Incorporating everything that I have learned from these reports into my valuation, I see little movement in my intrinsic value. Even allowing for a much more efficient use of capital in the future, my estimate of value per share is $22.53. It is still early in Twitter’s corporate life and like Facebook, and I did see this news story about Twitter perhaps entering the online retailing world, and while it may be just as much a sign of desperation as hope, it is true that young company narratives can change quickly. There is a lot more about Twitter (and its business model) that I do not know than I do, and I would like to see Twitter come through on their promise of better metrics of user engagement with their business model. I am curious about how many users actually click on the sponsored tweets. I don't like to extrapolate from personal experience but I not only have never clicked on one (or even been tempted to do so) but I find myself irritated to see tweets in my timeline from businesses trying to sell me their products and services. For Twitter's sake, I hope that I am an outlier. I am also curious about how much it is costing Twitter to get new business (how much does it cost to add an advertiser) and what their pricing system for ads is. After all, surging revenues don't have much value, if your costs to deliver those revenues surge even more. As someone who uses Twitter a lot more than Facebook, I would like to see the company succeed, but as an investor, I remain a skeptic. I could go on with other companies but I think I will outlive my welcome. With just these three companies, I hope that I have been able to bring home two salient points about earnings reports. The first is that while it is always the most recent earnings report that people tend to focus on, there is value in looking at a time series of reports, since there are patterns that may emerge from that series. The second is that the patterns you observe should feed back into your narrative and valuations, reinforcing your existing views in some cases, changing them in small ways in other cases and shifting them dramatically in still others. The earnings report trail is leading me to different destinations: with Apple, to an exit point, with Facebook, to a shifting of perception on what the company is worth (though not to the point of being a buyer at its current price) and with Twitter, to no real change in my perception that while the company has promise but is over priced. In my last post, I looked at how earnings reports and other news stories about a company contain information that can lead you to reassess your narrative and consequently the value that you attach to that company. If you are an investor or analyst who is familiar with how markets react to earnings reports, you can legitimately argue that I am making this process more complicated than it has to be and that what you see at the time of the earnings report is a market reaction to how well or badly companies deliver on a specific pricing metric, relative to expectations. You are right and in this post, I will look at why investors often focus on these simple (and sometimes simplistic) metrics, how these metrics can change as a function of where a company is in its life cycle and the dangers of focusing on metrics rather than value. It is easier to focus on a single number or metric than it is to develop a narrative and a valuation for a company. Consequently, investors and many analysts prefer to spend almost all of their time in coming up with estimates for that number, on the assumption that if they are right about those estimates, neither narratives nor valuations matter. In several earlier posts, including these on Apple and Twitter, I have drawn a distinction between value and price and argued that while investors care about the former, traders are much interested in the latter. If you are a trader, it makes complete sense to not only find the metric that other traders are using to judge companies (even if that metric is a weak measure of value and subject to manipulation) but to make estimating that metric the center of your investment strategy. It is for this reason that I call this the "earnings game", where analysts and investors form expectations about a metric (earnings per share, revenues, number of users/subscribers), companies try to deliver actual numbers that beat these expectations and markets then react to the reports. I describe the process in detail in this post, with the aggregate evidence on both the market reaction to earnings reports as well as the post-report price adjustment process. For firms where the prime concern that investors have is about narrative breaks, the pricing metric reflects that concern. Thus, with young start-ups, investors may focus on cash in hand or access to capital, as proxies for survival risk. For distressed companies, the pricing metric may be linked to the company's capacity to service debt, interest coverage ratios or debt payments coming due. For firms that have well established narratives, i.e., firms that have established business models in clearly defined markets, the focus will be on narrative shifts, and small ones at that. Given that the market size is stable and market shares are sticky, you can see why investors pay attention to earnings per share and react to surprises on that score. For firms where the narrative is still taking form, investor will shift away from earnings not only to top-line numbers (like revenues) but to other measures that are related to narrative change. With social media companies, for instance, that explains why investors pay attention to the number of users or measures of user intensity, on the assumption that companies can exploit larger values for either to enter new markets. Thus, early in the process, it is not irrational to focus on market potential or users, but as a company matures, the attention will inevitably turn to profitability and cash flows. Using real-world examples to illustrate this shift, a company like Yo, priced recently at $10 million by investors, even though it really has no product or service to speak of at the moment, is being priced entirely on market potential (all those people with smart phones whose notification center is accessible to apps like Yo). Moving further up the life cycle, consider Snapchat, a company that has a product with tens of millions of users but has not figured out a way to monetize them, it is the number of users and the frequency of their use that drives its pricing (with Alibaba willing to pay $10 billion for them). With Twitter, Linkedin and Yelp, investors seem to be making a transition, where revenues are clearly part of the equation, even though the number of users is still a key number. With Google and Apple, companies with established business models, revenue growth is a consideration but earnings clearly dominate. Missing the rest of the story: The value of a business is driven by many determinants, including its capacity to generate profits (and cash flows) from existing assets, the expected growth rate in these earnings & the efficiency with which this growth is delivered and the risk in future cash flows. No single metric will ever capture all of these factors, and in using any metric (number of users, revenues, earnings), you are in effect assuming that everything else that drives value remains unchanged. To illustrate, a company that reports higher earnings per share but does so because it has entered riskier businesses, may see its stock price jump on the earnings report, even though its value has dropped. Tunnel vision: It is natural to develop tunnel vision, when your focus narrows. Investors and analysts who spend all of their time and resources refining their estimates of one or two metrics, whether they be revenues or number of users, will soon care just about those numbers and ignore the rest of the data (and story). Game Playing: Once companies recognize that investors are focused on one or two metrics, it is natural for them to play the game as well. Thus, if analysts are unduly focused on earnings per share, companies will play accounting games to make their earnings per share look better than they should. I argued that the market's focus on the number of users at social media companies best explained why Facebook would pay $19 billion for Whatsapp. Transition Phases: As the life cycle picture illustrated, investor focus does change as a company moves through the life cycle. It is therefore a given that at some point in time, as social media companies evolve and grow, investors will stop looking at the user base and focus first on user engagement with business models (revenues) and then on the profitability of these models (earnings). However, these transitions are unpredictable, and when they do occur, companies that think that they are playing by market rules (delivering more users than markets expected) may be shocked to discover that the rules have changed (and that they are being punished for losing money). To play the earnings report game, if you are a trader, you have to be able to both pinpoint the metric that markets will react to (which may not always be the metric that analysts following the company are focusing on) and be better at estimating how the company will do on that metric than other investors. If you can play that game well, it is a lucrative one but it is also risky, since seismic shifts can occur from quarter to quarter. That is why it may behoove traders to understand the narrative/value process described in my last post, even if they choose not to invest based upon that process. Reality shows seem to have taken over much of television, but I am not a fan for two reasons. The first is that I don't enjoy watching people who are either so psychologically damaged that they like living their lives in a fishbowl or are so economically desperate that they do not have a choice. The second is that while I recognize the draw of these shows comes from their unscripted nature, I prefer getting my reality jolts from two other forums. The first is live sports, where the allure is that no matter how scripted a sport is, there are those moments of magic, where anything can happen. The second is financial markets, which delight in bringing investors and especially market experts to their knees by behaving in unpredictable ways. Just as ratings week is when television shows are made or ended, earnings season is when the markets deliver their biggest surprises. Building on a theme I introduced about narrative and numbers in an earlier post, I would argue that earnings reports are the vehicles that we should use to confirm, reject or modify narratives (and thus value). In my post on narrative and numbers, I argued that valuation acts as a bridge between the story tellers and number-crunchers and that in a good valuation, every number should be part of a story and that the story has to be checked for viability against history, common sense and data. I also argued that big differences in value can be attributed to differences in narratives rather than differences in numerical assumptions. Narrative breaks/ends: The most dire scenario is news that leads you to conclude that your existing narrative for the firm is no longer operative, rendering your original valuation moot. Narrative breaks are almost always bad news and can be caused by legal events (e.g., the Supreme Court decision that brought Aereo's disruptive efforts to a halt), economic events (e.g., the Argentine government default and its effect on the valuation of any Argentine company), government actions (the nationalization of a company or the removal of protection from competition) or credit events (a company's failure to make a debt payment, resulting in bankruptcy). Narrative shifts: In most cases, earnings reports don’t deliver large surprises about a company’s business model or direction, and this is especially the case for mature companies. Instead, you get is information that lead you reassess your narrative and extend that reassessment into new estimates for the company’s future revenues, earnings and cash flows, shifting value. 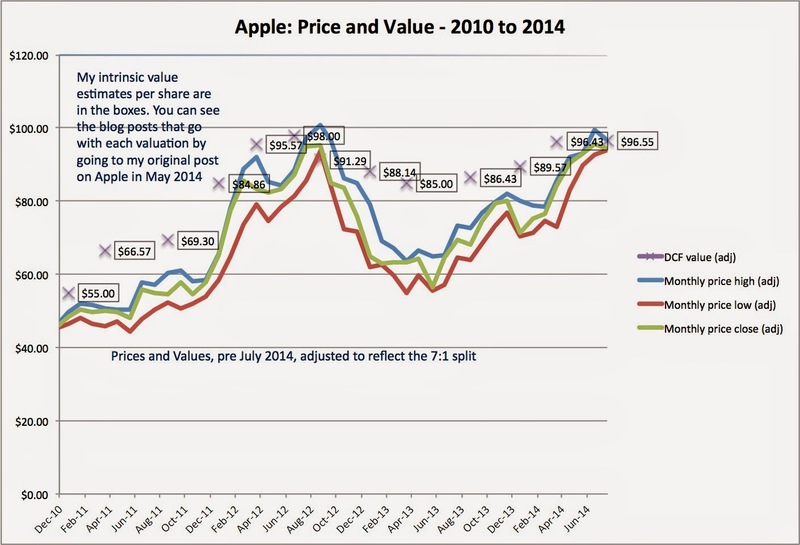 This is the exercise, for instance, that I chronicled in a post about Apple's earnings report on April 23, 2013, where I deconstructed the information in that report and looked at its impact on key inputs into Apple's valuation. Note that narrative shifts, especially if they are consistently positive or negative can lead to major changes in company value over time. This has been the case for a company like Google, which in spite of all its innovations and new services, derives almost all of its revenues still from online advertising but has done it so well that it has managed to expand both the size of the overall online advertising market and its share of it over the last decade. Narrative changes (expansion/contraction): In some cases, earnings reports deliver news that may be peripheral in terms of the impact it has on operating numbers (revenues, earnings) but are significant because they signal that the company’s business model is changing in ways that you had not anticipated in your original narrative. No company has epitomized this process better than Amazon, a company that I have valued multiple times since 1998. In my very first valuation of Amazon, I valued it as a book retailer, but in subsequent valuations, I have seen it evolve first into a specialty retailer, then become a general retailer, and in recent years, make forays into the media, entertainment and cloud storage businesses. I am sure that there are people more prescient than me who saw all of this coming in 2000, but I sure did not, though notwithstanding that vision failure, I still found Amazon to be cheap (and a good investment) at least four times in the last decade. Your classification (break, shift or change) will depend upon your initial narrative: The more expansive your initial narrative, the more likely it is that you will see narrative shifts, rather than radical changes. Let me take Uber as an example, and use the contrast of my narrative with Bill Gurley's to illustrate this point. Uber is still private but any information that I receive about Uber’s success in suburban markets will be a narrative change for me, since my base valuation is built on the presumption that Uber will be successsful as a urban car service company. For Bill Gurley, whose base narrative already incorporates expectations of sucess in suburban markets, this news will be more of a narrative shift than a change. The lines between the categories can become fuzzy: Even for a given narrative, information in an earnings report or news story can fall in gray areas and be tough to categorize. For instance, Facebook’s better than expected performance in the mobile advertising market in its last few quarters may be viewed by some as just a narrative shift (giving them a larger market share of the online advertising business) and by others as a narrative change (with the mobile users giving them a platform that they can use to enter other online businesses), with very different implications for Facebook's value. 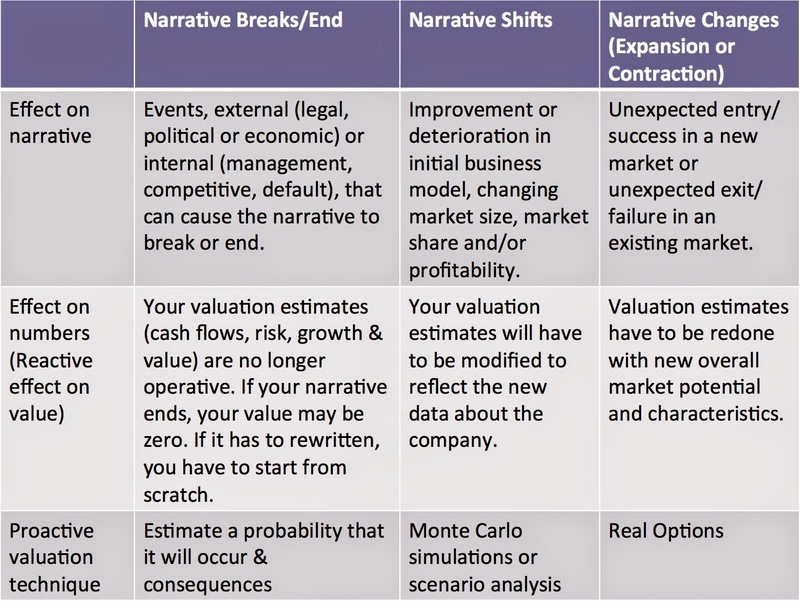 Narrative adjustments can vary across time, for the same company: As a company reports earnings over many periods, you can see narrative shifts in some periods and narrative changes in others, good news in some and bad news in others. Staying with Amazon, a company that I used as my example of a successful narrative changer, the market reaction to the last two earnings reports has been brutal, as markets seem less focused on revenue growth (which continues to be extraordinary) and more on profit margins (which have been abysmal). A narrative shift may be occurring, where investors are reassessing Amazon’s potential profitability in steady state and concluding that it will make less money than they thought it would. How do we deal with these narrative adjustments in conventional valuation? Very badly, I am afraid. If your valuation is a rigid discounted cash flow valuation, your response to narratives breaking, shifting or changing is denial. In that static world, the narrative remains constant, your valuation inputs stay the same, intrinsic value never changes and it is the market that is viewed as being at fault for its volatility. 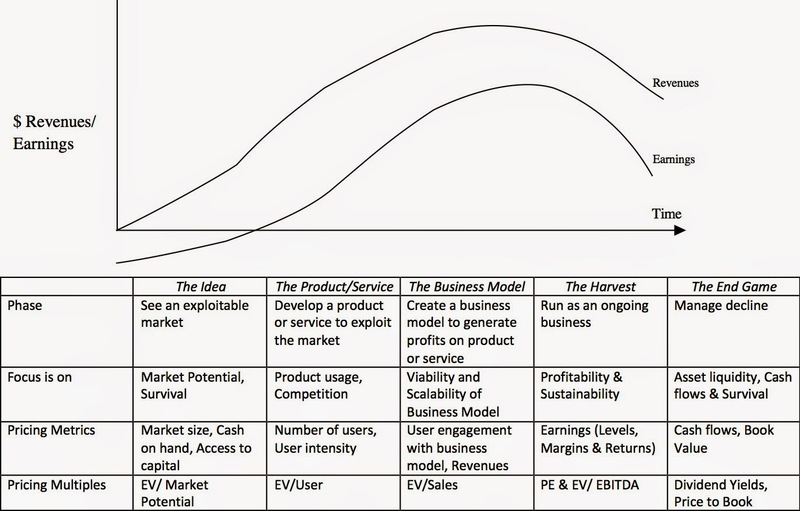 Even those who claim to use more dynamic processes for valuation often stay within the traditional framework, trying to increase discount rates to reflect potential narrative breaks and growth rates to capture narrative changes. Finally, even the best among us tend to be more reactive than proactive, adjusting value for narrative adjustments that have already occurred, but not making any attempt for the potential for adjustments in the future. Earnings reports remain a company's key delivery mechanism for news about both its operations and plans of the future, but they are filled with distractions. Paraphrasing Nate Silver, it is important that we separate the signal from the noise and use these reports to revisit our narratives and valuations. If you are an avid market watcher, you may feel that I am over analyzing the earnings process and that the market reaction to an earnings report has little to do with narrative shifts or long term value, and more to do with meeting investor expectations on key numbers (earnings per share, revenues, number of users etc.). I don't disagree with you and in my companion post, I will focus on the metrics that investors use to judge earnings reports, why these metrics might vary across companies and over time and the potential danger of letting these metrics determine investment decisions. If taking the same action, over and over, expecting different consequences, is the definition of insanity, it aptly describes the US tax code, where legislators write tax laws designed to elicit bad behavior, moan about the consequences and then write even worse tax laws. In the last few weeks, AbbVie’s acquisition of Shire seems to have brought the complaints about perverse tax law and badly behaved corporations to a boil. In particular, the news headlines have been centered on AbbVie’s plan to move its corporate headquarters to the UK from the US after the acquisition, part of an emerging trend among US companies towards tax inversions, designed to generate tax benefits. The New York Times thinks it borders on the criminal, Paul Krugman accuses corporations of being "tax dodgers", Senator Carl Levin has written legislation to stop the practice and even Jon Stewart has joined in the fun. To understand the “inversion” story, you have start with the US tax code. The US requires domestic corporations, i.e., companies incorporated in the US, to pay the domestic marginal tax rate on their global income. It is one of eight OECD countries that continues to use a global tax system, while the remaining twenty six OECD countries have shifted to a territorial tax system, where corporations pay the domestic tax rate on income that they generate domestically and the local tax rates on income generated in foreign locales. (See the list of countries using each tax system at this link). The US tax law does allow for a timing lag, since the differential tax (between the US tax rate and the tax rate on the foreign income) does not have to be paid until that foreign income is repatriated back to the US. To illustrate, assume that you have a US company that generates $50 million of its income in the US (with a tax rate of 40%) and $50 million of its income in China (where the tax rate is 25%). The company will pay a total of $32.5 million in taxes when it generates that income, 40% of the $50 million of US income and 25% of the $50 million of Chinese income, If the company now returns the $50 million in Chinese income to its US domicile, it will have to pay the differential tax of $7.5 million, reflecting the differential tax rate of 15% (US tax rate - Chinese tax rate). What happens if the company chooses to leave the cash in its Chinese subsidiary? That cash of $50 million cannot be used for investments in the United States or to pay dividends/buybacks to stockholders. In effect, it is “trapped”, but it can be used for investments anywhere else in the world. The longer the company continues to hold back cash in foreign locales, the larger the trapped cash balance becomes and after a decade of not repatriating cash, it can amount to hundreds of millions or even billions of dollars. The trapped cash that the company has is no longer trapped and the differential tax due to the US dissipates into thin air. The larger the current trapped cash balance, the greater this immediate benefit will be. The second tax benefit is that the company’s future income in China is no longer subject to a differential tax and is thus released from that obligation. The tax benefits from relocation will therefore be greater for companies that expect their foreign operations to grow at a higher rate than their domestic (US) business. Given how large these potential benefits can be for many US companies, relocation becomes an attractive option and inversion is one way of accomplishing this objective, though a 2004 law does put restrictions on its use. With inversion, the company will acquire a Singapore-based company of sufficient size (to meet the law's requirements) and relocate the headquarters of the combined company after the merger in Singapore. US companies are more global: As the rest of the world's economies have grown, the US economy has become a smaller part of the global economic order and US companies are increasingly dependent on their foreign operations. In 2012, almost 50% of the revenues of S&P 500 companies came from foreign locales, with the number varying widely across sectors (with utilities getting almost no revenues from outside the US and technology companies getting about 58%). In fact, this document has an exhaustive breakdown of this phenomena. It is also worth noting that in 2012, the companies in the S&P 500 paid $146 billion to the US government and $139 billion to foreign governments as taxes, which should dispense with the canard that the foreign income of US companies is somehow untaxed. The combination of the globalization of US companies and a high US marginal tax rate has had predictable consequences. Companies that generate a big portion of their revenues from outside the United States are choosing to leave the income they generate overseas. Last year, the cumulative trapped cash at US companies was conservatively estimated at more than $1.5 trillion, and growing. Apple alone had more than $100 billion in cash in its overseas locales and a large portion of AbbVie’s current cash balance of $10 billion is probably trapped its foreign subsidiaries. AbbVie can use this trapped cash outside the US, to invest in non-US assets or but non-US companies, but the decision to move its headquarters to the UK frees it up to invest the money wherever it wants (including in the US). The UK follows a territorial-based tax system, where you pay taxes based on where you generate income and not where you are headquartered. Thus, the question again becomes not why AbbVie is buying a UK-based company and moving its headquarters to London, but why it took them so long. Do US companies pay their fair share of taxes? Any question about whether someone else is paying their fair share of taxes is fraught with complications, since the rule in this debate is that every tax payer (and even a few who don't pay taxes) seems to believe that he (she) pays more than his (her) fair share of taxes and that the rest of the world is shirking. We have all heard the anecdotal evidence about individual companies that don't pay their fair share of taxes and I am sure that some companies fit the billing of tax scofflaws. To answer the question of whether US companies collectively are tax avoiders, relative to corporations elsewhere in the world, I computed the effective tax rates for all publicly traded companies listed globally and estimated the average effective tax rates by sector and by region. The effective tax rate is computed by dividing the accrual taxes in the income statement by the accrual taxable income reported in that same statement. In the table below, I compare three measures of the average effective tax rate across global companies: the simple average effective tax rate across all companies (including money losers), the weighted (by taxable income) average effective tax rate across all companies that have a positive taxable income and an aggregate tax rate (obtained by dividing the total taxes paid by the total taxable income). There is something in this graph for almost every side of this debate. On all three measures of the effective tax rate, Japanese companies pay the most in taxes, even though Japan has a territorial tax system where foreign income is not taxed at the Japanese marginal tax rate (of approximately 38%), backing those who believe that the US will gain from moving to a territorial tax system. When you look at the weighted (by income) average effective tax rate across money making companies, US companies actually pay a higher percentage of their taxable income than much of the rest of the world and almost as much as European companies, bolstering those who contend that US companies pay roughly the same amount in taxes as companies in the rest of the world and are not tax shirkers. However, those who contend that US companies pay too little in taxes will undoubtedly point to aggregate effective tax rate, which is lower in the US than in the rest of the world. 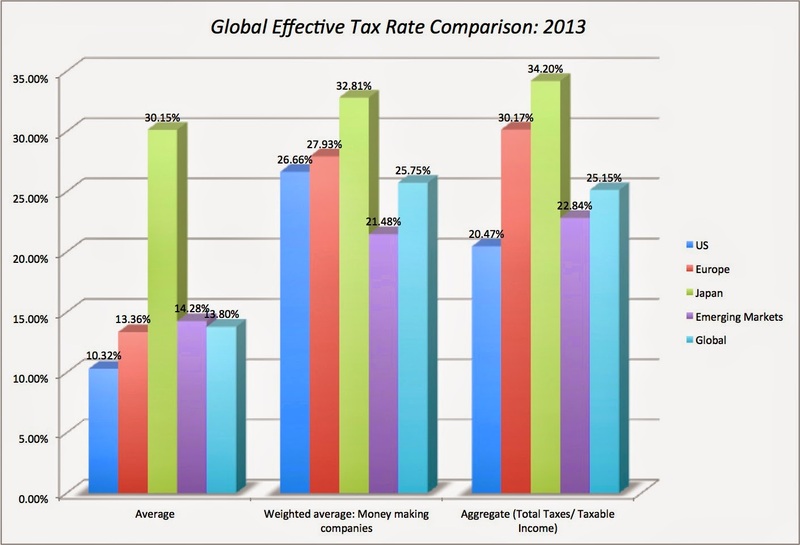 My measure of how effective a tax system is the difference between marginal and effective tax rates. 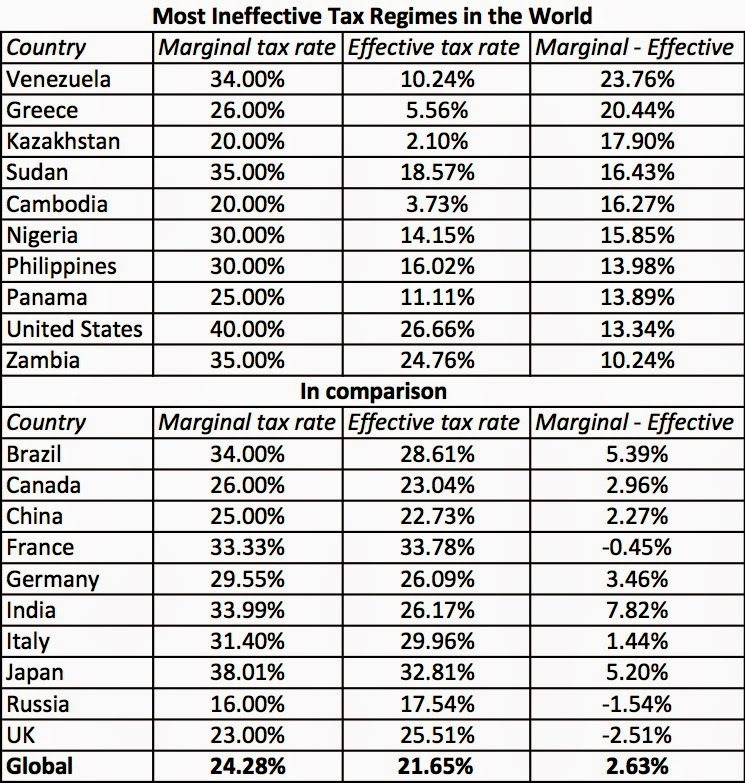 I computed this statistic, using the marginal tax rate at the start of 2013 and the effective tax rate for that year, for every country for which I was able to obtain both a marginal and an effective tax rate, and ranked them based upon the difference. The list below includes my ranking of the ten most ineffective tax regimes in the world, with a comparison to some developed markets and four emerging markets (Brazil, India, China and Russia). I don't think that you will get any disagreement from either side (right or left, Republican or Democrat, liberal or conservative) that the US tax code today is ineffective, though the solutions they offer are starkly different. The combination of a global taxation system, high marginal tax rates and debt-friendly clauses in the US tax code create predictable and perverse consequences. With the current tax law, US companies will continue to move more of their business and earnings overseas and keep the cash there, reinvest too little in the US, borrow too much (often to pay dividends or buy back stock to US investors) and hold on to too much cash. At this point, if you are a US taxpayer, you are probably boiling with rage, ready to pick up your pitchforks and to attack unpatriotic companies. Vent as much you want, if it makes you feel better, but you have to decide whether you want a tax code that makes you feel good or one that actually works. Some of the solutions suggested to the US tax problem may work well as political selling points but will only worsen the perverse effects. Once you label corporations as tax dodgers, crooks or reprobates, you are signaling that you favor a punitive solution. After all, why would you try to negotiate with such entities? Before we look at some of remedies (mostly legal) that are being suggested for both trapped cash and tax inversions, it is worth retracing the three steps in the process that lead to these remedies, with the flaws in logic I see in each step. The first step is an appeal to patriotism, where corporations are asked "what they will do for their country of incorporation, rather than what that country will do for them". In fact, the taxation of global income at the US tax rate is not restricted to US corporations. It applies to all US citizens who work abroad, requiring them to pay not only the taxes due in the country in which they work in but the additional tax that they would owe the US, if that country has a lower individual income tax rate than the US does. Thus, long-term expatriates working in low-tax locales are given a choice of whether they want to continue to be US citizens (and pay the extra tax) or give up their citizenship. In effect, their patriotism is put to the test and while many people pass that test (even if it means paying extra taxes), more and more chose to give up their US citizenships each year. There are some who think that US corporations can be put to the same patriotism test, I don't think that the argument make sense. Since a publicly traded company is owned by its stockholders, should we determine patriotic standing based upon the nationality of the stockholders who hold its stock? Thus, should a US company where Chinese own 51% of the outstanding shares try to maximize taxes paid to the Chinese government? Even if you don’t buy the “stockholders as owners” argument, what if more than 50% of your employees now work in a different country? Is it your patriotic duty to maximize taxes paid to that country? Shame corporations into paying their "fair" share of taxes: An extension of the patriotism argument is to push the theme that it is shameful for taxpayers not to maximize taxes paid to the government. You may view this as a sign of my moral decay or ethical shortcomings, but I don't believe that taxpayers (individual or business) should be required to maximize taxes paid to the government. That does not preclude individual taxpayers who want to maximize taxes from doing so, but you cannot demand that other taxpayers (individuals or corporations) do more than pay what they legally owe in taxes. Force immediate tax payments (and ban inversions): The punitive solutions almost always revolve around legislation. You could change the US tax code to force all multinationals to pay the US marginal tax rate on their global income, when the income is earned, not when it is repatriated and the trapped cash problem will go away, we are told. Really? I will argue that passing this law will create two consequences. The first is that if you think that US companies moving their headquarters outside the US is a problem now, it will become a deluge, if you pass this law. The second is that even those multinationals that choose to stay US-based will spin off their foreign subsidiaries as stand-alone companies. I guess you can try to pass more laws to prevent both these developments, but legislation that goes against common sense (and economic self interest) is doomed to fail. There are two other weapons that the punitive solutions crowd plan to use to keep companies in line. The first is to bar companies that move their headquarters outside the US from ever doing business with the US government. Thus, AbbVie’s drugs can be removed from the list of Medicare/Medicaid allowed medications, which would cost the company money, but would also leave a whole group of patients in both programs without their preferred medicine. And if enough US pharmaceutical companies follow AbbVie out the US, then what company’s drugs will be left on the medication list? The second is to penalize stockholders in companies that move outside the US by charging them a higher tax rate on their dividends/capital gains. I am not even sure how this would work, but I am sure that an aide to some legislator will come up with a "can't miss' scheme. Implicit in the punitive solutions is the belief that the benefits that companies get from being incorporated in the United States are so large that most of them will not consider moving elsewhere. But what exactly are these benefits? The first is the legal and institutional protection that operating in the United States offers companies: a well-functioning, efficient legal system that enforces laws and contracts is critical to running businesses. The second is the political climate in the US has historically been viewed as more favorable for private enterprise, in general, and corporations, in particular. Both may have been compelling considerations three decades ago, but the US advantage has shrunk on both counts. European countries, other than France, have become more receptive to businesses and Asian and Latin American countries, not counting the obvious exceptions, are fixing their worst excesses. In fact, there is reason to believe that just as the rest of the world is getting friendlier towards corporations, the US is moving in the opposite direction. There is a temporary solution to the problem that will alleviate the immediate pressure on companies to invert and that is to offer a tax holiday, where companies will be allowed to bring their trapped cash home, without paying taxes due or only a small portion thereof. It will be marketed as a one-time deal, and will be coupled with feel-good clauses, requiring companies to use the cash to fund more investments and create more jobs in the United States. Not only will these investments and jobs never come to fruition, but the incentive to let cash build up in overseas locales will only increase after such actions. After all, one-time tax holidays that seem to happen once every decade are really not really one-time, are they? If we do not want companies trapping cash in overseas locales or trying to move from the United States, there are two solutions. One is to lower the marginal tax rate for US corporate income to a level closer to those that you observe in the rest of the world, since it reduces the cost of repatriating foreign income to the United States. On that count, the Obama administration's proposal to lower the marginal corporate tax rate to 28% is a sensible one. I believe, though, that this has to be coupled with a shift to a territorial tax system, in recognition of the reality that corporations are now multinational in every sense (investors, employees, operations) and have to be treated as such. In conjunction, I think the tax code should be stripped of most or all of the "goodies" that legislators have added to it over time. Will these changes create costs, especially in the near-term? Of course. There will be companies that will pay more in taxes than they do right now and tax lawyers and transfer pricing specialists will have to find something else to do. Paul Krugman will probably have a conniption, Senator Carl Levin's legislative masterpiece will not see the light of day and Jon Stewart will have to find other comedic material. To be honest, I would not be unhappy with any of these developments. Writing bad tax law is easy, but changing it is really difficult. It is generally true that even the most sensible (and obvious) fixes to the tax law can be used against those who vote for it. Populists of all stripes (right and left) will tar you as a corporate stooge or worse, if you do vote to lower corporate tax rates or change from a global tax to a territorial tax system. Not only am I pessimistic about Congress making sensible changes to tax laws, but I fear that any changes that get made will only make the long term problems worse. That, in turn, will set off a new round of outrage and more misguided tax law changes and the cycle will continue.